You guys. Between my recent hummus post and this one, I have come to a very important conclusion - everything tastes better when spiced butter is poured on top. That might sound obvious to you, but if you need some convincing, I highly encourage you to try this recipe. Now, I tend to think that fresh summer corn is perfection all on its own, but it turns out that it's even better with garam masala butter. This recipe is perfect for September, when fresh corn is still in season but temperatures are cooling off a bit. The creamy corn and Indian spices are comforting and warming, exactly right for fall. p.s. It just occurred to me after publishing this post that the garam masala butter would be amazing on mashed potatoes. I'll try it and report back! I used a commercial garam masala blend rather than making my own - it's much easier that way. You can find garam masala in Indian grocery stores. However, if you'd like to make your own, check out the original recipe. Cut kernels from corn into a large bowl. Use the back of a knife to scrape the juices and pulp from the cobs into the bowl. Transfer half the kernels and 1/4 cup water into a blender or food processor. Blend until smooth. Melt 1 tbs butter in a large pan over low heat. Stir in onion, garlic, and 1/2 tsp salt. Cover pan and cook until onion is soft and translucent, stirring frequently, about 10 minutes. Do not let onions brown. When onion is done cooking, stir in pureed corn and corn kernels. Cook, stirring occasionally, for 10 minutes. Season corn with salt to taste and transfer to a serving bowl. In a small saucepan, melt remaining 2 tbs butter over medium heat. Add garam masala and a pinch of salt. Whisk butter until fragrant, about 15 seconds. Pour butter over creamed corn and serve. Very interesting! I haven't had creamed corn in years, and it's only ever been the canned stuff. I bet this is great and the spiced butter extra delicious. of course spiced butter makes everything better! i can only imagine the combination on potatoes is also fantastic... or perhaps roasted veggies? yum! I think you're right that spiced butter would work on most everything. 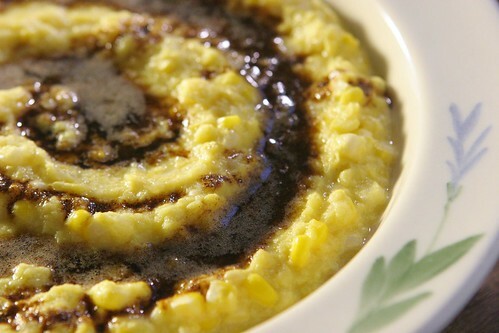 Love the sound of this sweet and smoky creamed corn!